For a long time scholarship has been seeking the origins of Christian worship in the synagogue. In this new major book, Margaret Barker traces the roots of Christian worship back to the Jewish temple. By proposing a temple setting, a great deal more can be explained, and the existing rather limited resources can be more fruitfully used. Working with primary sources in translation, it is possible to reconstruct something of the early Christian world view, which shows the Church as the conscious continuation of the temple worship.Fundamental practices such as baptism and the Eucharist had Temple Roots, and familiar words in the liturgy of the church such as Maranatha and Hallelujah derived from the ancient belief that the Lord appeared in the Temple. Jesus was the God of Israel manifested as a the Great High Priest, and the Christians were his new angel priesthood, singing the angelic liturgy to restore and renew the earth.The chapters in this book cover baptism, in theology and practice, the Eucharist, with special emphasis on the symbolism of the elements, the significance of music and hymns, festivals and pilgrimage, use of the Scriptures, both what the early Christians used and how they read them, prayers, including the Lord's prayer, and the shape of church buildings. 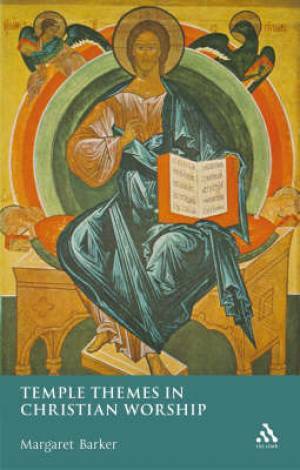 Temple Themes in Christian Worship by Margaret Barker was published by Continuum in January 2008 and is our 64193rd best seller. The ISBN for Temple Themes in Christian Worship is 9780567032768. I recently reviewed a companion work to this book also by Margaret Barker. This was The Great High Priest, subtitled, The Temple Roots of Christian Worship. This could easily have been the subtitle to this volume as well. Once again, Barker’s purpose is to show how so much of Christian worship has its roots in the Jewish Temple. She believes this is because the first Christians consciously saw themselves as continuing in their own liturgical life the worship offered in the temple in Jerusalem. She begins by elucidating this idea, building a picture of the world view of the early Church, and then in the light of that looking at the sacraments of the Eucharist and baptism, the festivals and the music, together with a consideration of such matters as the construction of church buildings. Those who follow where Barker leads must, however, be prepared to enter a very different world from the one we might previously have thought the world of the first Christians to be. In the Preface, she makes the point that ‘the temple was a world of its own, with its own language, its own symbols and stories. The literalism that we consider accuracy was alien to this way of thinking and being, where talking snakes and seven horned lambs were the sophisticated symbolic theology of a non-philosophical culture’. Once you have grasped this, you can begin the exciting adventure of trying to understand why the worship of the Church took the form it did and what the meaning of some of these practices might be. The book will mainly be of interest to scholars but the more general reader can benefit from a detailed and intriguing account of both temple and early church worship. It does not exhaust all that Margaret Barker has discovered: she does not touch upon art or architecture; and she says she has not written about the role of the Blessed Virgin Mary. So there is more to come! Got a question? No problem! Just click here to ask us about Temple Themes in Christian Worship.